The Minnesota Twins had to place Byron Buxton back on the disabled list as of May 30. Playing through a broken toe, the pain was simply too much to bear and the decision needed to be made. With center field now up for grabs at the big league level, there appears to be a set of players that could make a lot of sense. First and foremost, the Buxton injury is unfortunate. Back when he first returned from the DL, I was on record as being fine with the decision to skip a rehab stint. Knowing full well that would negatively impact his hitting, the reality was that the outfield was a mess the more often they played without his defense. With the Twins having had the accurate information on the fracture far longer than the public , it’s irresponsible that Buxton was allowed to play despite not being able to swing comfortably. It’s one thing to play through pain, but Minnesota allowing Buxton to jeopardize himself further i\\was silly. What’s done is done at this point however, and Paul Molitor needs to move on with his lineup. The pitching has been there for this club most of the season, and it’s been the lineup that has simply fallen flat. What’s worse is that there aren’t going to be any promotions that immediately spark some sort of a turnaround. Sure, Nick Gordon could’ve (and should’ve) been promoted while Miguel Sano was on the DL. Outside of that though, the Minnesota doesn’t have any offensive impact prospects that present a groundbreaking opportunity. In the wake of Buxton’s injury, there is an opportunity to capitalize on a spark and provide potential future benefits however. Both Zack Granite and LaMonte Wade exist for Derek Falvey and Thad Levine. Following a similar thought process as to why Buxton was activated without a rehab stint, defense is obviously of integral importance for the Twins. Understandably, neither Wade nor Granite will be on par with the best defensive outfielder in the world, but they are also (specifically Granite) capable of playing at a high level on their own. The reality is that the Twins current roster construction forces journeyman Ryan LaMarre to either start in center on a regular basis, or pushes one of the corner guys over to accommodate Robbie Grossman playing in LF. The former option isn’t an awful one defensively, but there’s no upside. After a hot start, LaMarre has hit .111/.126/.111 in his last 31 plate appearances. On top of that, he’s 29 and not part of future plans. Looking at the latter option, there’s not much convincing that needs to take place to argue that Grossman doesn’t belong anywhere with a glove on. Both Granite and Wade have recently returned from time on the disabled list this season, and Zack is hardly producing at the level he displayed during 2017 at Triple A. With just a .206/.292/.224 slash line for Rochester, there’s a lot left to be desired from what Granite is currently doing. That said, it’s his approach that gives him a chance (9/13 K/BB), and he displayed an ability to at least handle big league pitching a season ago (40 G .237/.321/.290). Wade’s numbers are much more respectable (.295/.393/.439) but come at the Double-A level. The jump for a mid-tier prospect is a big one, and won’t come without hurdles. Regardless of what stock is put in either of Granite or Wade’s current numbers, future considerations make a move for one of them look so sensible. Either could slot in as a regular contributor on the 25-man roster in the next few years, and allowing them to get regular playing time while Byron is shelved seems like a no- brainer. 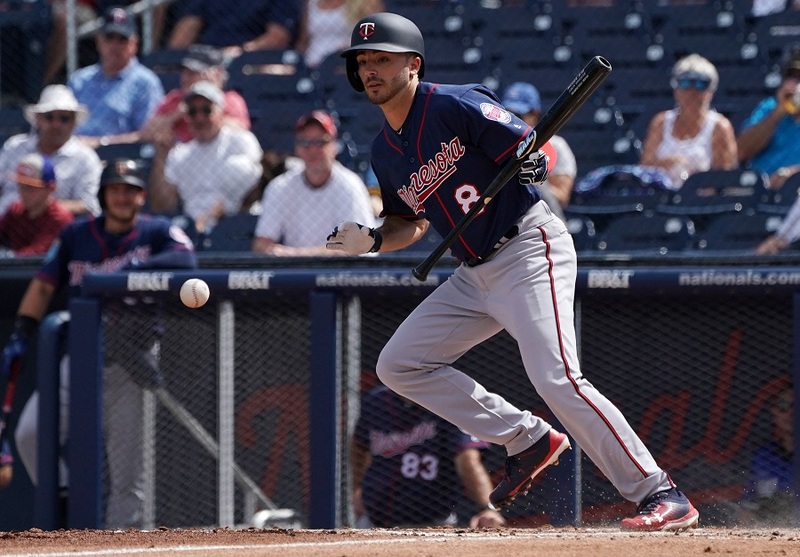 Molitor’s current options leave a gaping hole in playing time, so neither prospect would be coming up simply to sit. It’d be somewhat foolish to expect Wade with his good numbers or Granite with his poor ones, to provide some sort of fix-it type spark to the Twins. Going forward though, there’s a significant benefit to getting them the reps currently doled out to LaMarre (or Grossman when he’s in RF) and watching them settle in against the best competition. Both players are on-base threats, and if they can push the envelope while Buxton is out, then you’ve got a decision to make on LaMarre or Grossman when Byron returns. At the end of the day, the Twins are doing themselves no favor by hoping Ryan LaMarre changes course on his career, while instead turning away from opportunities to challenge players with a potential future. I like this.In fact I like both Granite and Wade up and LaMarre and Grossman out.Save the defense!The offense from the two that we currently have is nothing worth saving. We want Wade, clap, clap, clap. It would be nice to see Wade. While they're at it, I'd like to watch guys like Gonsalves and Gordon as well. If the team is going to stink I'd like something to keep it interesting. Summer has barely started and they're already basically playing meaningless games. It really puts a damper on my evening dock-sitting and beer drinking. Granite is hitting .206 with zero power and next-to-zero XBH ability at AAA. I see him more as a DFA candidate than an option in the majors. Wade needs to be called up ASAP. He has nothing left to accomplish at AA and should at least be at AAA right now. I hate to say it but I think I’ve moved more to intrigue about who we trade away at the deadline and further away from hope this thing gets on track. What a dumpster fire of a season so far. Pitching and hitting can’t get on the same schedule, guys can’t stay healthy. And this is the vicious cycle of a MN sports team. Am I jumping the gun yet? The dilemma is that I don’t think the Twins want to play Wade in center field. I mean, they aren’t even playing him in center ar Chattanooga, so it just seems really unlikely that they’d be willing to play him in center for the big club. At the same time, I don’t think they want to play Kepler in center every day either. And if that’s the case, we’re looking at LaMarre or Granite...neither of which do much for my excitement level. At a corner, Wade is behind our two healthiest and steadiest performers. There, I’ve done my part....Wade will be called up any day now. Grossman needs to go..... no place for a one dementional (at best) "OF" on a young team trying to develop a championship core. There are just not enough bench spots for any one dementional player. I see no good reason for this team to keep Grossman at this point. He does nothing well, and he's not young. Wade can DH and give people a break. For CF? Rosario or Kepler for me right now. Get Wade up here. Get Carter up here to DH until (if) Mauer comes back. Or get Gordon up here and DH Sano. And for God's sake get Dozier out of the lead-off spot. Agreed, LaMerr brings nothing to the table and is not a big league player. He has to weak an arm for centerfield. Rather see Granite getting those at bats then LaMerre. Grossman can provide some hitting and decent bench bat. Not a consistent starting player. Yuck on Carter, this team already has low OBP and strikes out to much. A nice perspective and write-up. I have to argue a couple points, however. Granite has a skill set offensively and defensively that provide value. (SSS at AAA right now in 2018). But Granite got hurt and was unavailable for a time regardless. I get the call for Wade, I really do. And I'm still not sure why he didn't start the season at Rochester, except maybe concentrating on budding power potential. OK. But he also got hurt and just came off the DL. You can't promote guys to the roster who are on the DL, as much as you wish you could. I have felt Grossman was a potentially solid 4th OF despite hoping/wishing for competition, based on what he has brought to the table the last two seasons. The injuries to Granite and Wade have given him an extension. But I think we are the point of saying perhaps enough is enough. LaMarre hit in ST, hit early in the season hit when be went back to AAA. He hasn't hit since he came back. SSS with his "new approach" or just reality? What about Cave? Are we really better off with Grossman, at this point, playing more and more OF, or some sort of platoon in CF and letting Kepler just be comfortable in RF? Would love to see Wade. But fresh off the DL at AA, where does he play? Can he play CF better than Kepler? Better than LaMarre/Cave/Granite? How about RE with Kepler in CF? Not sure the best answer, just posing the question. Despite this being an OF post, what about Gordon? With Sano back, and starting to heat up, is there room for Gordon to play daily? Polanco is a good month away. I'd promote Gordon at this point to play daily/almost to allow Sano to play 3B/1B/DH with Escobar to swap between 3B and AS. It's just time to shake stuff up! BTW, does Vargas now get ANOTHER shot with his recent hot streak? Would a Davis promotion be out of bounds for the DH role? *A real rehab and ready Mauer could change some of this. What I find amusing about these threads will be the TD reaction after Wade gets promoted to MLB... There will without question be something saying DFA him the moment he has a cold streak. Let's take context here. Both Granite and Wade have spent time on the DL this season, and as noted, that makes it difficult to promote (side note, I do think Wade should get the call to AAA in the not so distant future). The other problem is that we've had a couple decent seasons out of Grossman, of which were very good for a 4th OF, and I can certainly see the FO's desire to see if he can figure it out. You don't jettison major leaguers because of a bad slump, especially when there's no guarantee their replacement will be any better. I don't get the fascination with Granite. He's basically a singles hitter. That's not bad as an occasional sub batting 9th, but not a starting OF in MLB. He's a defensive sub, and should have a decent career as such. But I don't see Granite fixing much of anything... not long term at least. I'd probably role with Cave for the time being at CF. Rosario, Kepler, Granite, and Wade are all left hand hitting batters, which makes your OF very inflexible.Cave too.LaMarre and Grossman are righties (or sh) and that's what they bring on the table. Zander Weil who has been hitting .311/.377/.446 in AA (better than Wade) and Jimmy Kerrigan who is hitting .299/.364/.516 between high A and AAA, are the only decent options at high levels. Add the fact that Baddoo, Kirilloff, and Arias are all LHH, the Twins are really hurting for right handed outfielders, and DFAing Palka who has a .833 OPS in the majors was a mistake. Sadly, that pretty much sums things up so far this season. Very frustrating. I don't agree with but understand the argument about not DFA'ing Grossman for Wade, but I really think it's about LaMarre. Even if Wade struggles hitting, his best skills are drawing walks and avoiding strikeouts. The Twins lineup, the bottom part in particular, have been killing this club by hacking at the first pitch and weakly putting the ball in play as soon as the game gets turned over to the other team's bullpen. Even if Wade doesn't hit, he should at least be able to give better at bats than what we're seeing. Not sure Grossman's 2017 was anything special for a 4th OF. He was a league-average bat with terrible defense, that's basically replacement level. In 2016 his bat was probably good enough to offset the bad defense (although metrics don't necessarily agree), but it sure seems like 2016 might be the outlier offensive performance of his career. Also, I don't think they would have to "jettison" Grossman. First of all, they could swap a guy in for LaMarre first, but even if they wanted to swap out Grossman too, he hasn't been worth his $2 mil salary, so it's quite possible he clears waivers. And he can't refuse an outright assignment. So we could keep him around in Rochester, in case of another injury, Wade struggling, etc. Rosario, Kepler, Granite, and Wade are all left hand hitting batters, which makes your OF very inflexible.Cave too.LaMarre and Grossman are righties (or sh) and that's what they bring on the table. Rosario and Kepler aren't going to sit against LHP, and they've actually been solid against LHP this season anyway. So I think you could still afford to run Wade out there too (I'm not so sure about Granite). Both Granite and Wade need to shake off the rust before they get called up.I presume that if one of them gets hot, and LaMarre really struggles, we will see the move made. Alternatively, with Buxton on the DL, I hope Kepler continues to get some starts in CF.He has looked a bit uncomfortable there but has the skills for it and needs the reps.
Are you saying that promoting Wade now is a comparably extreme opinion as calling for him to be DFA'd after a slump? Otherwise, I'm not sure how relevant this statement is. They are very different injury cases. Granite was bothered by an injury during spring training, spent over 3 weeks on the DL, and still isn't hitting well. That has definitely complicated any 2018 promotion plans for him. But Wade was fully healthy this spring, and healthy and hitting well into mid-May. He didn't get hurt until he collided with a wall on May 19. Given the Twins still hadn't even promoted him to AAA by that point, even while repeating AA with improved power etc., there really isn't a case that the injury has seriously impacted their promotion plans for him this year. Wade was pretty hot as of May 19 (his injury date), at which point LaMarre was 4-for-22 with 9 K's since his 3 hits in extra innings vs Cleveland. And Buxton at that time was 2 for his last 23 with 9 K's and playing through injury. If they weren't willing to promote Wade by then, even just to AAA, I'm not sure what we can presume about their promotion plans for him in the near future. I'd probably expect Jake Cave to get the next call. Looking at last night's box score.I notice that at the end of the game, LaMarre has the highest OBP of any Twin that appeared in the game.And he bats right-handed...and he's a real center fielder.Inconvenient facts.I'm sure he'd apologize for all this if given the opportunity. It just doesn't seem likely that LaMarre is going away real soon.Seems more realistic that it would the the scenario that I think Mike mentioned where you'd have Wade basically replacing Grossman...playing somewhere, including turns at DH, almost every day.That's the key for Wade, there has to be a scenario for him to play most every day before you're going to bring him up.I think. Granite has really only hit one year of his professional career.Not optimistic that he's going to be a player that you want in the lineup every day. If you're looking for the hot hand, that'd certainly be Cave. Since being sent back to Rochester, he's hit three homers in nine games and has a .313/.371/.594 line (.965 OPS). Unlike Granite, however, I'm not sold that Cave is a legit CF. Rosario, Kepler, Granite, and Wade are all left hand hitting batters, which makes your OF very inflexible. Cave too. LaMarre and Grossman are righties (or sh) and that's what they bring on the table. Zander Weil who has been hitting .311/.377/.446 in AA (better than Wade) and Jimmy Kerrigan who is hitting .299/.364/.516 between high A and AAA, are the only decent options at high levels. It was pretty easy to see last offseason that a RH OF was a need... Instead they went with LaMarre who's had little to no success in the MLB. Can't say I'm shocked this isn't working out for the team. I don't get the call for Wade to wait until he can play every day..... With this group, he never gets that chance....in the outfield. With everyone healthy, he's never more than the fourth OF. So, why wait? I'm also good with giving Cave a shot instead. Lamarre will not likely be good, but I'm talking replacing Grossman here anyway, so if they want to watch Lamarre slowly fall back to bad fill season numbers, fine. But Grossman adds nothing to this roster, now or in the future. And it's time to think of the future.